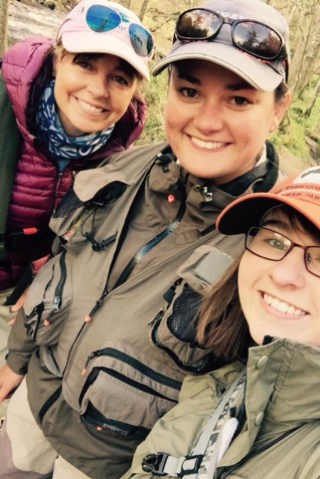 Fishing for wild brown trout on the Tees last weekend on a stretch of water only available to guests of Wodencroft Cottages I met up with two ladies from England Ladies Fly Fishing team, Phillippa Hake and Lisa Isles. The weather was not great, bright sunshine and an easterly wind. The Tees is fed by Cow Green so river temperatures don’t tend rise much until the reservoir starts to warm up around June, it was going to be a tough day. With no hatch we started fishing using jig nymphs, czech nymphing through the fast, turbulent water. England lady, Lisa Isles demonstrated to us how to catch fish effectively using this method, and quickly had two beautifully marked fish to her net after a few casts. We weaved our way down the river casting our nymphs into deep pools and across the streamy glides. The river was low and the bed exposed, my mind wandered, in the right water height this is going to fish well for salmon. After lunch the England ladies fished the middle section and and watched fish gorge on a significant hatch of large Dark Olives. With an endless supply of food on the surface, another three came to Lisa’s rod, including a plump 2lb specimen, and Phillippa caught her first Tees fish. Further down stream there was no hatch, it just shows what a difference it can make being in the right place at the right time. On the opposite bank I watched a chap float fishing for salmon. Time to change tactics, if he’s fishing for salmon their will be trout in that deep water too I thought. I lengthened my line and changed the fly to a pink nymph, it felt good to cast a full length of line across a pool. My fly glided gently downstream and on the dangle a trout munched on it, a decent 1 1/2lb to 2lb wild brown trout. Relieved and smiling I was happy I had not blanked. Looking forward to catching up with the girls after their England matches for a return trip to the Tees in June to fish Northumberland Water’s Cow Green Reservoir. Wodencroft Holiday Cottages & Bed and Breakfast in Teesdale is set within a peaceful rural location with South-facing views on a riverside estate. Located in the heart of the North Pennines English countryside, near the historic Durham market town of Barnard Castle and between the villages of Cotherstone & Romaldkirk. Both cottages are part of a conversion of buildings, which formally were one of the Yorkshire Schools made famous by Charles Dickens in “Nicholas Nickleby”. There is no additional charge, is only offered to guests staying at the luxury Woden Croft Holiday Cottages and comprises of 1 mile of double bank fishing and 1/2 mile of single bank – read more.